Besides one of the world’s top tourist destinations, Thailand’s capital, Bangkok, ranks as one of the world’s best food cities and Asia’s food capital. As Thailand’s main culinary epicentre, Bangkok provides a breathtaking plethora of culinary options, while its distinctive cuisine and street food culture, is again, ranked as some of the world’s best. Locals constantly eat out everywhere, even late at night. To experience authentic Bangkok street food, we head out nighttime to some of the city’s best rated and authentic local eateries. Sample favourite dishes, such as Kao Mun Kai (Thai-style chicken rice) and Pad Thai Noodles, at the respective neighbourhoods of Pratunam and Pratuphi. We also take-in some of the city’s main landmarks and iconic sights, beautifully illuminated at nighttime. Founded in the 13th century, the royal city of Sukhothai in Central Thailand was the Siam Kingdom’s first capital. 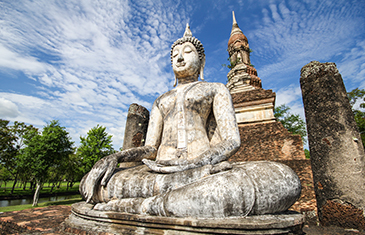 The cradle of Thai civilisation, Sukhothai oversaw the ‘Golden Age’ of Thai history. 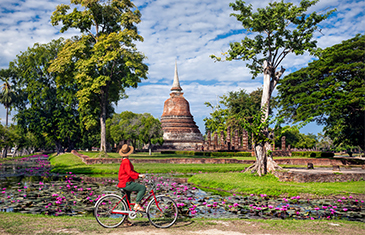 Most of the Sukhothai Kingdoms’ vast wealth of historical sites and ruins are contained in – and surrounding – an expansive old walled city, the Sukhothai Historical Park and UNESCO World Heritage Site. Impressive temple and palace ruins include Wat Sri Chum, housing a giant seated ‘Immovable Buddha’, within a sole standing mandapa. In both ancient and modern times, Sukhothai’s has been celebrated for its fine ceramics and porcelain. At family-run Suthep Sangkhalok Factory, observe how potters have produced for centuries the famed Sangkhalok ceramics. At Ganesha Sangkhalok store-museum, try your hand at ceramic making. A two-hour drive brings us to riverside Lampang, an under-the-radar provincial city, best known for its horse-drawn carriages, ceramics and Burmese-style temples. Visit Baan Sao Nak, a monumental teak wood house, constructed in 1895 during the reign of King Rama V. Nestled in manicured gardens, this traditional Thai house demonstrates both northern Thai and Burmese design influences, including a Lanna-style roof and structure, supported by 116 square teak columns. Baan Sao Nak has been converted to a local museum, furnished with Burmese and Thai antiquities. Later, enjoy a horse-drawn carriage ride, a favoured local transport mode and fun way to explore this quaint city. We tour Thailand’s oldest standing wooden structure, Wat Phra That Lampang Luang, housing the nation’s sole emerald Buddha (with exception of Bangkok’s Wat Phra Kaew). Continue to Chiang Rai and Golden Triangle region, where the borders and mist-shrouded mountains of Thailand, Laos and Myanmar converge at two rivers. The Golden Triangle is infamous as formerly one of the world’s most prolific opium producers and source of drug trafficking. Various Thai organisations have spent decades battling this trade. Nowadays, this naturally beautiful and peaceful mountainous region, home to temples and hill-tribe villages, is a popular tourist destination. Tour the acclaimed Hall of Opium Museum, which educates in a light-hearted manner about all things opium, including a historical perspective on the trade and region. In Thailand’s northernmost province, the sleepy provincial city of Chiang Rai boasts abundant historical, cultural and natural attractions. Experience some of Chiang Rai’s highlights on a three-hour boat cruise along the Mae Kok River, which itself flows through the city. Encounter northern Thailand’s authentic back country, revealing stunning landscapes of towering mountains, dense jungle and verdant fields. Stop at one of the area’s traditional hill-tribe villages, home to the Karen ethnic minority group, originally migrants from Myanmar, to observe their traditional way of life. 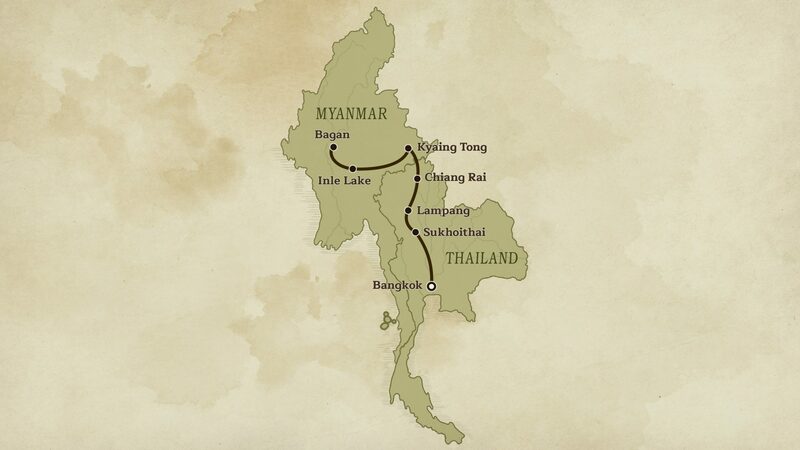 Join an adventurous elephant safari before continuing by boat to local hot springs. We also visit a hill-tribe village of the Lahu ethnic group, known for their distinctive hand-woven attire. After undertaking the overland border crossing from Thailand into Myanmar, we arrive at Kyaing Tong, a small trading town in eastern Shan State. Originating from the 13th century, lakeside Kyaing Tong is renowned for its scenic beauty and upkeep of many of its age-old traditions. Embark on a full-day sightseeing tour, first exploring the colourful central market, a wonderful opportunity to see local vendors who have journeyed down from remote mountain villages to sell their wares. Continue to Maha Myat Muni Pagoda, housing a Mandalay-Style Buddha image, hot springs and an old catholic church. Catch sweeping views across Kyaing Tong at sunset on Lone Tree Hill, where a two-centuries-plus old Kanyin-byu tree stands, planted by the founder of the third Myanmar Empire. Our day concludes at Yan Gone pottery village, where we observe how earthenware pots of the Shan ethnic group are produced. Drive from Kyaing Tong to Loimwe, enroute passing stunning mountain terrain and terraced rice fields. We also make a few stops at some of the many isolated ethnic minority villages. Aptly translating as “misty mountain” the scenic town of Loimwe is elevated at 1,600m (5249ft) above sea level, surrounded by soaring mountain peaks. In town, highlights include the old British Governor’s House and Catholic Church, lingering remnants of the British Colonial-era. In outlying mountainous terrain, we hike to villages that are home to some diverse hill-tribe groups, such as Wan Lun Shan, Nang Cho Wae, Panwai Lahu and Ho Lup Akha – the latter distinctive for their colourful attire. Here, we can encounter up-close the Burmese remote and traditional hill-tribe life. Arrive in Central Myanmar’s Shan State. At 22km (13mi)-long and 11km (7mi)-wide, Inle Lake is Myanmar’s second largest freshwater lake and nestled in highlands at an altitude of 880m (2,887ft), one of its highest. This impossibly scenic lake is home to rich flora and fauna and 200-plus floating villages. Explore this serene, magical water world on a boat cruise, gliding past stilt-house villages and floating gardens tended by locals from small wooden boats. Disembark at Phaung Daw Oo Pagoda, the lake’s most revered site, housing five small Buddha images entirely coated in gold leaf. Continue to Heya Ywama Village to observe traditional Burmese handicraft workshops, including silk weaving on wooden handlooms, cheroot making (traditional cigars) and gold and silversmithing. Upon our return, cruise past Intha fishermen, unique leg rowers who row their boats with one leg wrapped around an oar. 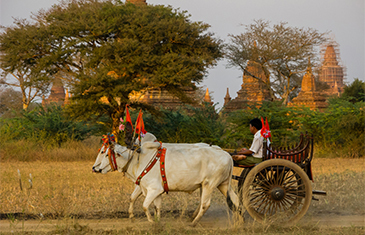 Arrive at Bagan, the ancient capital of several ancient Burmese Kingdoms that constructed up to 4,400 temples between the 11th and 13th centuries. Today, approximately 2,200 original temples remain standing, the reason why Bagan is regarded as one of Asia’s richest archaeological areas. Today, we visit several notable temples, including 13th century Nandamannya Temple, containing fine frescoes and exotic murals. Take a breather from temple hopping with a horse-cart ride to Minnanthu Village, where we observe daily village life. Head to Nan Myint, a silo-shaped viewing tower and meet an esteemed historian and anthropologist. He will present a fascinating private lecture on Bagan’s ancient kingdoms. 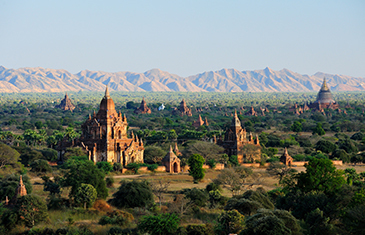 Afterwards, from the uppermost observation deck, catch the sun setting over Bagan’s temple-filled plains. Head to Mount Popa, also known as Taung Ma-gyi, an imposing extinct volcano 1,518m (4981ft) above sea level. Along with nearby Taung Kalat, a 657m (2,156 ft)-high volcanic plug, Mount Popa is the sacred abode to Myanmar’s 37 mythological spirits, known as “Nats” and an important Nat pilgrimage site. Atop of Taung Kalat, the revered Taung Kalat Buddhist monastery-temple is accessed by ascending 777 or so stone steps. Along the route, we pass numerous temples, gilded shrines and stupas. The adventurous and spiritually-inclined are rewarded with stupendous views of Mount Popa. Later, drive to Salay, home to a slew of monasteries and British colonial-era buildings. Visit 19th century Yoke Sone Kyaung Monastery, nestled beside the Ayeyarwady River and famed for its elaborate wood carvings. Transfer to Bagan Nyaung U Airport for your onward flight.